Total return: 13.8% (in less than 3 months). Note that X is irrelevant here. As long as the total dollar amount used for shorting was also used on the long position, this was a hedged transaction. The risk was the arbitration risk -- i.e. that the deal wouldn't close. Since the offer price was to buy CYCL for $8.50 per share, today's price tag of $8.40 was good enough for me. Note also that I lost a bit on the short side, but as long as the prices converged to the appropriate ratio, the end result would have been beneficial, which it was. When I mention these short-term opportunities, I can't help but feel a bit like a trader, or a short-term speculator. However, there's a big difference between an arbitrage position versus a speculatory market-timing trade -- the latter of which I do not engage in. Arbitrage is one of two short-term transactions I find suitable for an intelligent investor to attempt in the stock market. The other one being smart option investing, which I'm still to discuss here. Disclosures: No more positions in the above mentioned securities. I'm not a big fan of just criticizing. I prefer to offer better alternatives. However, today I'd like to criticize the financial media in general. It's not that there isn't news to be reported or information to be shared. It's just that the noise-to-signal ratio is too high to have much value, unless one has special talent in tuning out the noise. I believe the main reason for all the noise is that opinions are free and everyone has one. Moreover, when financial reporters are paid big bucks to have an opinion, they're guaranteed to have one, and possibly a different one every day, since old news is, well, just that. When people in general focus on what they do everyday they often get so specialized that they forget that their world is not the whole world. When I go see my optometrist, she tells me to wash my eyelids 3 times a day with warm, soapy water. My dermatologist suggests that I wear sunscreen everyday, even if I spend the whole day indoors inside an office. How many times would a dentist recommend one flosses and brushes? And yet, by eating right and exercising I'd have a much bigger payout in terms of long-term health than following all the specialists' recommendations. Likewise, financial reporters must talk about the market. And so they do. If it's going up, there's a reason for it. If it's going down, there's another reason or sometimes the same reason as yesterday -- "investor's sentiment", they'll say. Over-analyzing stock charts and daily fluctuation of the markets has been shown time and again to be foolish. It only tells you what the majority of the market participants (by volume of money, not number of people) think the right price for the market is. Everyone has an opinion, and by following the opinion of the average market participant or that of the financial reporter at best only guarantees you're one step behind everyone else. At worst, it leads to financial destruction. You should have your own opinion and not let those paid to have opinions -- whether the opinions are right or wrong -- guide how you should invest your money. Collecting data and analysis based on data is the first step to forming your own opinion. There are respectable services out there that can help with that, such as Morningstar and Standard & Poors. However, none of these should be used as the final decision. Blindly following their star ratings is a recipe for disaster, no matter how well-trained the analysts might be. Because it's not their money that is on the line. It's yours. Second, because often times the recommendations are delayed, or are not updated frequently or both. And on top of that, their criteria for what a suitable investment might be is most likely completely different than yours. As a matter of example, consider S&P's star rating system. S&P claims that their 5-star recommendations beat the market over time. But is this purely due to enlightened analysis or some amount of hindsight? After all, not everyone can beat the market by following S&P's 5-star recommendation or that would be the market's return. The following is a chart of WMT as provided by S&P's free stock report, which can be obtained from many known online brokerages. The red ellipses are my addition highlighting periods where their target price tag (the line in orange) changed. Were these changes due to some clever insight or a knee-jerk reaction to the price change? Is it really possible to beat the market by being one step behind it? I'll let you be the judge of that. In summary: turn off the TV and tune out the noise. Use analysis services as necessary, but as a source of information, not as a recommendation. Disclosures: I own WMT at the time of writing. I was not compensated in any way for mentioning the names of the companies mentioned above. I'm often asked about whether I like gold as an investment medium. Historically, over long time periods, gold mostly retains its purchasing power. Gold doesn't go bankrupt, doesn't overstate earnings, doesn't write-down anything (its weight, for example). Physical ownership of gold cannot be confiscated by law or by electronic methods; force is required to take gold from someone. Gold doesn't pay a coupon or dividend. Gold can't cut costs, become more effective, increase earnings, expand market share or come up with a great new idea. Gold can't take advantage of acquisitions, market opportunities or low interest rates. Gold is hard to value. There's little industrial utility for gold, so demand is mostly speculatory and fear-driven. Basically, what this all tells an investor is that 1) gold provides little in terms of a decent, predictable, long-term return but that 2) gold is a good store of value for times of political and monetary uncertainty. Let's break it down in parts. As a commodity, the price of gold depends on "the market" and there is little in the way of assigning it a fair value. Bonds, on the other hand, can be assigned a value given a discount rate, inflation, maturity, credit quality and coupon rate. Stocks, though harder to value, can be valued independently of their market price too. Gold cannot. As such, how can one "invest" in gold and expect returns from it, without having a crystal ball? On the other hand, gold has historically(*), in modern times (last 100 years or so) held its value over time. Due to its fungibility and international acceptance it's a good medium of exchange ("currency") to have in times of trouble, war, economic instability, inflation, and maybe even deflation. This mostly applies to physical gold held close to the investor, not in a vault or via proxies. Gold is, then, a good hedge against inflation over long time periods. So how should an investor use gold? To me, it only makes sense to have gold as part of one's cash reserves. As I've said before, every investor, experienced or not, should have at least six months worth (more for increased safety) of living expenses in readily available currency such as money markets and savings accounts. And in my view, part of this reserve can be held in physical gold (other commodities may also qualify, but let's focus on gold here). If one is fearful of high inflation, political or economic instability, then increasing this allocation to a year or more makes sense. It also makes sense that this extra reserve be in gold. Currently, I don't own gold and have no intention of buying it anytime soon. The time to buy gold is when everyone is talking about prosperity, peace and low inflation. And even then, the role of gold should be limited to that half-year to a year reserve of readily available "currency", for emergencies. * Appendix: How well does the value of gold really hold up? I couldn't help but try to find what an ounce of gold could buy many centuries ago. Perhaps the historians could help? So, here's my uber non-scientific, back-of-the-envelope-ish analysis. 1 donkey in ancient Rome = US$ 303-405 today. The interesting thing is that the prices are in the general ballpark despite the centuries that have gone by. Neither the fish cost a tiny fraction of a penny nor the donkey was found to cost a trillion dollars. So, if that's even close to correct (which I can't confirm), it means that gold mostly retains its value, but "inflation" can catch gold too -- after all, it can be mined and thus diluted. Also, despite all the increased efficiency in farming techniques, raising donkeys and fish didn't seem to get much cheaper over the years but instead have appreciated in gold terms. This analysis, however, is mostly for entertainment value as I can't verify the validity of the prices above. Take it for what it's worth. Recently, I noticed a stock on my watch list that hasn't returned to its pre-financial-crisis level: Pharmaceutical company Eli Lilly (LLY). Here's my analysis. For a mature dividend aristocrat such as LLY, the dividend discount model is usually a good start in valuing the stock. LLY has raised its dividend for over 25 years. Over the last 10 years, LLY has raised its dividend a compound 7.86%. Year-over-year, the minimum raise has been 4%, the maximum 13% and the average raise was close to 8%. Meanwhile, earnings per share (EPS) growth has only compounded by 1.65%. So the growth in dividend is probably not sustainable without further improvements to the bottom line, such as cost cutting or acquisitions. If we assume a 1% growth in dividends (to match the growth in EPS) in perpetuity, and tag it with a 9% discount (my minimum expected return from solid stocks), the dividend growth model yields a price of $25. LLY currently trades at around $34, has a forward P/E of 7.8 due to analysts-expected EPS of about $4.25 for 2009. LLY's 10-year average EPS is only $2.00, though. The growth expected this year and next is attributed to a strong drug demand, the acquisition of ImClone and cost cutting. 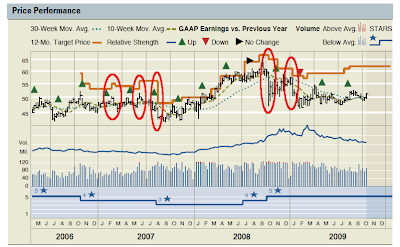 The company's own EPS guidance for 2009 suggests EPS between $4.20 and 4.30. It's unclear how sustainable this new EPS level is. Historically, LLY P/E ratio has been quite high: the average low P/E was around 22 while the average high P/E was 34. Counting on market euphoria to bring the P/E back to its historical lofty levels is never a good idea. My comfort range of P/E for a large and mature company such as LLY is between 10 and 15. Using LLY's average 10-year earnings of $2.00, we get a price tag of between $20 and $24. Looking at dividend and EPS growth and checking the P/E ratio is only part of the analysis. I said earlier that it's usually a good start because mature companies such as LLY often have stable earnings, growth, debt load and share count. But a further look at the balance sheet is always helpful. Consider the trends in the graph below. Looking at various balance sheet indicators as a percentage of sales can help spot worrisome trends. In this case, it's encouraging to see that both research and development (R&D) and accounts receivable have been moving inline with sales. Inventory had a run up in the past that warrants further investigation, but doesn't appear to be out of control. Selling, general and administrative expenses (SG&A) have been growing slightly faster than sales, which might indicate that LLY is not as efficient as it used to be 10 years ago. Nonetheless, the trend is not sky-rocketing either. Overall, these trends are somewhat reassuring that the dividend discount model is meaningful as it shows the fundamentals are not quickly deteriorating. Conclusion: from a purely dividend discount valuation and a check against a conservative P/E multiple and a conservative EPS estimate, my initial fair value for a share of LLY is between $20 and $25. Further investigation into drugs in the pipeline, patent expiration and integration of acquisitions is necessary to further determine earnings power and hence fair value. Disclosures: No shares of LLY held at the time of writing. I invest in municipal bonds. They serve as a place to park my cash (very short-term munis used in money market accounts) and as a component of fixed income of my portfolio (longer term maturities). But I also buy individual issues when they're mispriced. Nine to twelve months ago was a great time to pick up some bargains. Now, some bargains are back, but one must be careful, as munis have two sides, a reasonably safe one and an unsafe one. General Obligation municipal bonds (GO bonds) are typically tax-free obligations of the state, backed up by its taxing authority. That means that the state must do what it takes to pay them back, including raising taxes. So, unless a state becomes empty or some huge unheard of crisis hits, GO bonds should be a relatively safe investment. But they typically don't trade much below their face value and as such good deals are hard to find. One must look constantly for temporarily mispriced issues or other inefficiencies in the market. Not all GO bonds are "safe" since states can still default or issue IOUs. Revenue muni bonds are typically not backed up by the full-faith and credit authority of the state. They typically represent an investment by the state in a particular revenue-generating project such as a hospital, toll road, utility company, etc. In most cases, these bonds are guaranteed only by the revenue generated by the project. In some other cases, they are backed up by special taxes imposed on certain people (residents of an area or district) or company or both. But these taxes can't be arbitrarily increased to back up the bonds. While "unsafe" in nature, revenue bonds can be very safe investments if chosen wisely. There are opportunities lurking in plain sight in this area. When I search for muni bonds, I totally disregard credit quality (those letters such as "AAA", "B+", etc issued by Moodys, S&P or Fitch). Why? Because if I look at credit, I'll be delegating to the rating agencies the assessment of riskiness of the bond. After all, it's part of my job as an investor to find those "B-" or "B3" bonds that are really "AAA" in my assessment but that are mispriced by the market (because it blindly follows credit ranking). Maturity, yield and price. I start my search by ranking muni bonds per maturity, yield and price. The higher the yield, the best. But I prefer to see the yield being high because the price is low, not because it was issued at high yield to begin with. This is because when projects are high-yielding from the start, it's likely to be a high risk project. But they're fine too, as long as I understand the risks. I like the price to be below par and the maturity to be as short as necessary for me to get a good yield-to-maturity. Prospectus. Once I'm interested enough in the maturity, price and yield, I go read the prospectus. Just like a company's IPO prospectus, a muni bond has a similar document too. I look it up at the Municipal Securities Rulemaking Board's website. That's where I get to know for sure what the proceeds are going to be used for, what (if anything) guarantees my principal and my interest and all other terms that I'm looking for. Who/What Guarantees My Principal. This is one of the first things I want to know, even if it's obvious from the description of the bond. The prospectus clearly says if the state guarantees it based on its taxing power (GO bonds) or not and if not, what, if anything, backs it up. Sometimes, there's nothing backing it up, just the full-faith and credit of some private company. Run from these unless you know something about the private company in question. If special tax revenues back the bonds, go find out how many people/businesses pay this tax and how much they pay per year and what's the situation in that specific area. Insurance. Some bonds are insured by private companies. This sounds like a good thing but it really isn't necessarily and many investors miss this. First, in most cases, the insurance is for the interest, not the principal. If the state defaults, you may still lose your principal. Second, historically, the default rate on muni bonds has been low, and insurance companies know this, so they may take risks and insure more than they can realistically afford to. Now an investor has to look at the credit worthiness of the insurer and we don't trust the rating agencies, so it's more work. Finally, (and here is the counter-intuitive part) if faced with the possibility of default, states would probably be more likely to stop paying interest on the insured bonds as opposed to the uninsured ones. Why? Because then no investor would be harmed by the state, right? After all, the state is paying for the insurance, it might as well use it when needed. That means, insured bonds are probably the first to be defaulted on and if too many of these cases happen, the insurer goes broke and the investor gets the bill. I try to avoid insured issues when other opportunities exist. Sinking Fund. This is not as big a deal as it sounds. A sinking fund is cash set aside periodically to pay off the debt. It's typically a good thing to have, but is not a big deal in most cases. One must still look for it because it's possible in theory (though, rare) that in exchange for the safety of the sinking fund, the bonds are only redeemable at a discount of their face value. If that's the case, you need to readjust the face value and recompute the yield accordingly, if your broker or search site hasn't done so. Call Feature / Redemption Provisions. Bonds can be called (paid for and terminated) prior to their maturities. This is typically seen as an added risk, because it limits the return an investor will get. When times are good, borrowers pay off their debt ahead of time and issue new bonds with less attractive terms. However, and here's the rub most people miss, a call feature can be a good thing if one buys a bond at a big discount. By redeeming my long-term bond before its maturity, I realize the capital gain upside earlier, because bonds are typically called at par. This means I don't have to wait until maturity and the price converges to par immediately as opposed to over time. For some of the bonds I buy, the capital gain portion can be a bigger upside than the interest paid over time. Tax-Free, AMT Status. Believe it or not, some revenue bonds are not really tax free. I pass on those almost always since I can typically find better deals in the corporate world or elsewhere. The alternative minimum tax (AMT) status is something else to watch out for, since it can bite some investors and reduce their gains. Now you know more about muni investing than the next guy who is going by the Fitch credit rating and what his commission-hungry broker told him. So it's time to wrap up and choose your bond. The tricky part is that there are no hard and fast rules. After reading the prospectus and assessing all the risks, one must be satisfied with the yield and maturity or not. That's a personal call. My rule is to never buy bonds for any price above par, no matter how juicy the interest might be. I often screen them based on a maximum price of 90% of par and go down from there. This is because I want to have some upside and plus want to have a margin of safety in the case the bond gets called. I also don't consider munis if I can get better yield somewhere else, for similar risk profile. Why settle for less? Also, if the yield is so low to be comparable to a CD or a savings or money market account, then why bother? Next time, I will discuss current opportunities in GO bonds and a few risky issues I found on the dark side of munis. Why Does Warren Buffett Buy Entire Companies?